This Hgh Spec 4 bed modern new build property has a beautiful contrast between the new straight lines & the soft touches of stone to the exterior. The mixture of both these materials creates a very striking property. Agia Sofia is a colourful and executive villa located in Tremithousa, near Tala, Paphos, boasting the most stunning views across it's large private pool towards the Meditteranean Sea. Relax and enjoy your holiday in this stunning new 4 bed villa built by a quality, independent developer who has ensured the highest of standards throughout. The main door is situated along a very neat, established & interesting garden with various tropical plants to admire. The main door provides direct access to the large spacious open plan living, dining & kitchen area. The modern use of red, grey, black & white create a very impressive living space which is full of all the essential living necessities. The expansive open plan area hosts a large corner sofa with a large TV in the corner. Major premium channels being included make this ideal for chilling when it gets too hot or sitting by the stove on an off-season evening. One of the villa's main features is the fully retractable glass patio doors which allow you to see the stunning view of the immediate patio/pool area following on to the undisturbed views of the immediate countryside and coastline. The fully equipped kitchen offers all the essentials you will need to enjoy the property to its most, with all the mod cons you would expect to find. The addition of 3 stools along the breakfast bar of the kitchen area offers you, as guests the ability to grab a snack or chill with a cool drink in your hand as you chat with the family members while food is prepared. The property has been fitted throughout with air-conditioning units in all the living and sleeping areas to allow you to have the maximum comfort during your stay. In the dining area, the glass topped & metal framed dining table offers seating for 6. While for larger groups the outside table is extendable to accommodate 8-10 comfortably. In various points throughout the outside space the addition of extra tables & chairs creates a lovely opportunity to enjoy a moments peace or space should you wish it. Moving through the villa from the lounge area past a very modern seating area, the first bedroom is accessed on the right hand side. This bedroom offers a large king-sized double bed & 2 bedside tables & lamps. 2 length wardrobes ensure you have ample space for your personal belongings. Upon leaving the bedroom immediately to the left is the downstairs bathroom. This large space has a double shower cubicle with WC & wash basin. Once back out in the living area, you will notice the staircase with its striking artwork. Once on the first floor, the large bright airy landing space has again been created into a relaxation area to chill out with a book & a drink should you wish to. This floor accommodates the 3 further bedrooms within the villa. To the right of the stairs you will find another separate bathroom for use by the 2 twin rooms (can be doubles). There is a small balcony with a contrasting wooden surround which will allow you to enjoy the morning sunshine with views of the mountains or the cool shade of the day in some peace & quiet. Next to this is the first of the twin bedrooms offering colour and bright space with again full length wardrobes for your belongings. As we continue back across the landing to the left is the other twin bedroom offering a comfortable sleeping area with a view from this window down over the pool & garden and then out to the stunning view of the sea & coastline in the distance. The master bedroom also offers spacious sleep space with a large King-sized bed & wardrobe while offering its own en-suite bathroom with a large double shower cubicle, wash hand basin & wc. The view from this bedroom is breath-taking. The large patio door leading out onto the part shaded pergola balcony offers you a truly stunning 180 degree view of the countryside, towns & villages in front and the sea & coastline views. The property further benefits from ceiling fans and fly-screens in all bedrooms. It is fully air-conditioned. Pool/Beach Towels are included as are extras such as hairdryer. A travel cot and highchair can be provided upon request. From the balcony of the master bedroom, there is also a metal spiral stairway which leads to the fully enclosed terrace on the roof, offering a truly stunning 360 degree view from the villa of mountains, & sea views. The roof terrace comes with the option of seating & table or 2 sun loungers for you to truly enjoy undisturbed sunshine. This truly stunning villa is set within its own completely secure walled garden. The driveway is accessible via a push-pull sliding metal gate & the full length gate allows pedestrian access to the property also. The centrepiece of the outside areas is the stunning 11m long x 4m wide private pool (heated outwith summer**) with Roman Steps for ease of access. Below the pool is a second patio for lounging in the sun, sitting admiring the views and general relaxation. The glass balustrade at the boundary ensures clear views of the stunning landscape and sea at all times. LATE AVAILABILITY DISCOUNT	Bookings of 7 nights or more made within 28 days of travelling discounted by 10% LOW OCCUPANCY DISCOUNT	1-2 guests: 10%, 3-4 guests: 5% Please note that Low Occupancy Discounts do not Calculate automatically on this platform. Please contact us for quote and information if you qualify Only One Discount Can Apply Air-conditioning and Welcome Pack Included. Mid-Stay Clean and Linen Change for Stays of 10-28 nights Wireless Internet and Premium Channel TV Included. All rates based on 4 bedroom unless of Low Occupancy Discount whereby 2 bedrooms will be available for 2 person occupancy and 3 bedrooms for 4 persons. ** Please note that the twin beds can be made into doubles/super-kings. Please request at time of booking or at least one week prior to arrival** Pool Heating is included in the Rental Rate advertised from 20th September until 31st May. Should there be a requirement outwith these dates we can provide a quotation and charge as an extra. What a wonderful property - tucked away but with all mod cons. Great TV system, well equipped kitchen, comfortable living area and bedrooms. Amazing infinity pool overlooking the Paphos region. REALLY didn't want to leave. Absolutely recommended. Villa Agia Sofia is situated in the breathtaking hills of Tremithousa which is just on the Northern edge of Paphos. Its elevated position ensures all-round town and sea views which can be enjoyed from the landscaped garden, swimming pool and from most rooms of the house. 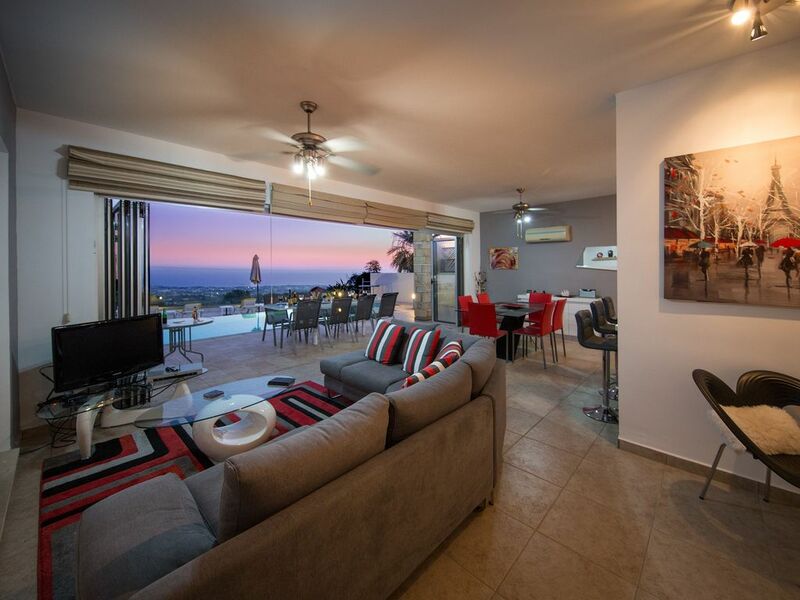 Only a 15 minute drive from the Blue Flag beaches at Coral Bay and from the centre of Paphos, Tremithousa is a popular location for visitors, ex-pat residents and holiday home owners alike. Looking down on the main town of Paphos (out to the Med), this is a more traditional village which allows you to see the quieter way of life yet still offers all the local amenities you would require. Within 800m from the villa is the village square where you find a local taverna called Ollies which offers an array of food & drink at all times of day & night. There is also a main hub of shops offering a larger choice from bakers (24 hours wth hot and cold food takeaway), supermarkets, more choice of eateries, petrol station & kiosk meaning anytime you find yourself needing to get something, there is somewhere close by to allow you to do so. The village of Tremithousa sits proudly on the hill above Paphos, giving you stunning view of the city & areas. It also has easy access to the main Polis road & quick links to the motorway making it a perfect location to be for you to do your sightseeing towards Limassol, Larnaca & the Troodos mountains. There is also a direct road to Tala which has a brilliant atmospheric village square where food & drink is offered all day & night. The monastery of Tala is also an excellent visitor attraction. Paphos Town can be reached in 10 minutes or less and the beaches and coastline at Coral Bay and Paphos are just 15 minutes away. Neighbouring Tala offers a peaceful location with a good village heart including the impressive monastery (with cafe and cat sanctuary) and a fine selection of bars, restaurants, traditional tavernas and other eateries. Just outside Tala into the hillside is &lsquo;Vatouthka', a family run Taverna with amazing views and atmosphere. The Sunday lunch buffet is the best value around and booking is always advisable. Neighbouring villages Emba and Mesogi offer a further choice of restaurants and shops away from the main tourist areas. Mesogi is home to 2 large bakeries and couple of the best traditional tavernas around. Kelftiko night at Vassos' taverna on a Thursday is a must do. Great traditional atmosphere, authentic food, music and dancing until late. The villa provides an ideal location for wedding parties and honeymooners with the many weddings that take place in Cyprus (the island of love), and is perfect for those seeking a peaceful, relaxed lifestyle within close proximity of modern amenities.